Scope 1: Direct emissions from company—owned facilities, processing plants, and machinery, perhaps from natural gas or coal combustion to produce process heat; some companies may include the emissions generated by animals’ digestive systems at company—owned farms. Scope 2: Off—site emissions, including emissions from electricity generation. Scope 3: Upstream and downstream “product chain” emissions consisting of on—farm emissions from livestock, manure, farm machinery fuel, livestock feed production, production of the inputs needed to produce that feed (e.g., nitrogen fertiliser), land—use changes triggered by the expansion of livestock grazing and feed production, and other sources. 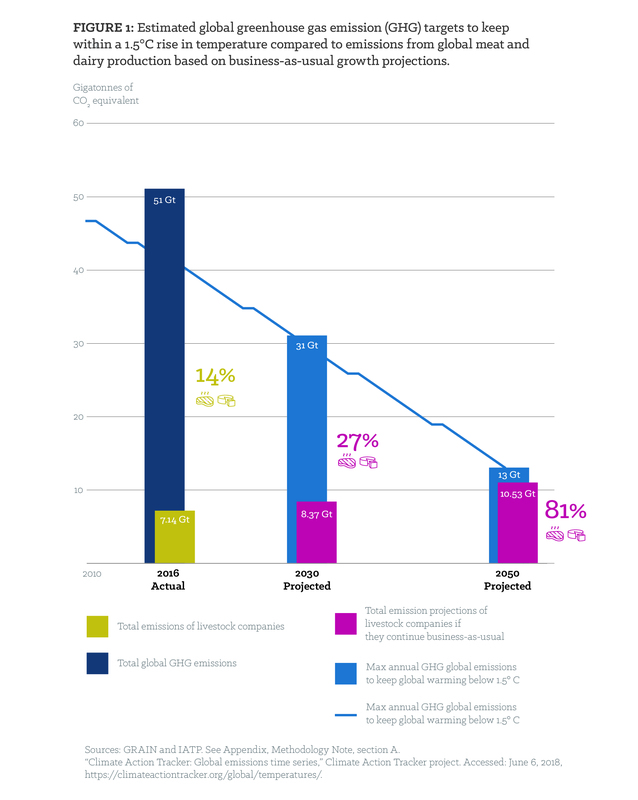 Scope 3 captures the lion’s share of emissions from a given company or food product in the meat and dairy sector. It is critical to include all Scope 1, 2 and 3 emissions if one is to meaningfully answer a question such as “what quantity of GHGs does Cargill emit into the atmosphere from its meat production processes?” Unfortunately, most companies report only narrow assessments of Scope 1 and 2 emissions. Unlike their counterparts in the energy sector, the big meat and dairy companies have thus far escaped public scrutiny of their contribution to climate change. The lack of public information on the magnitude of their GHG footprints is one contributing factor. 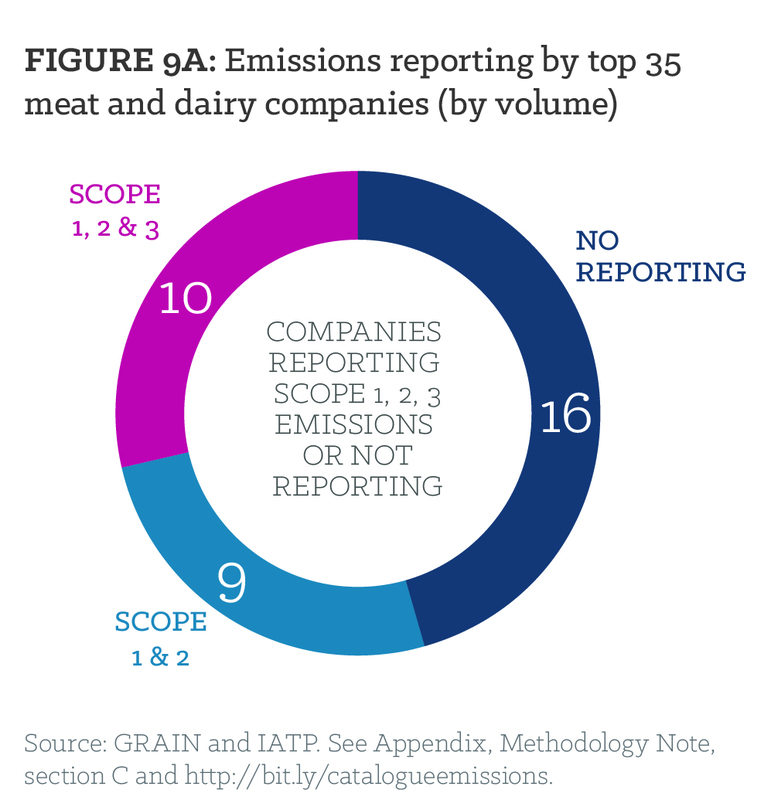 GRAIN and IATP have reviewed the efforts undertaken by the world’s 35 largest11 beef, pork, poultry and dairy companies to quantify their GHG emissions. We found the publicly available data on their emissions to be incomplete, not comparable between companies or years and, in the majority of cases, simply absent (Figure 9). Only four companies—NH Foods (Japan), Nestlé (Switzerland), FrieslandCampina (the Netherlands) and Danone (France)—provide complete, credible emissions estimates. However, under the current circumstances, even these four are not obligated to reduce these emissions. 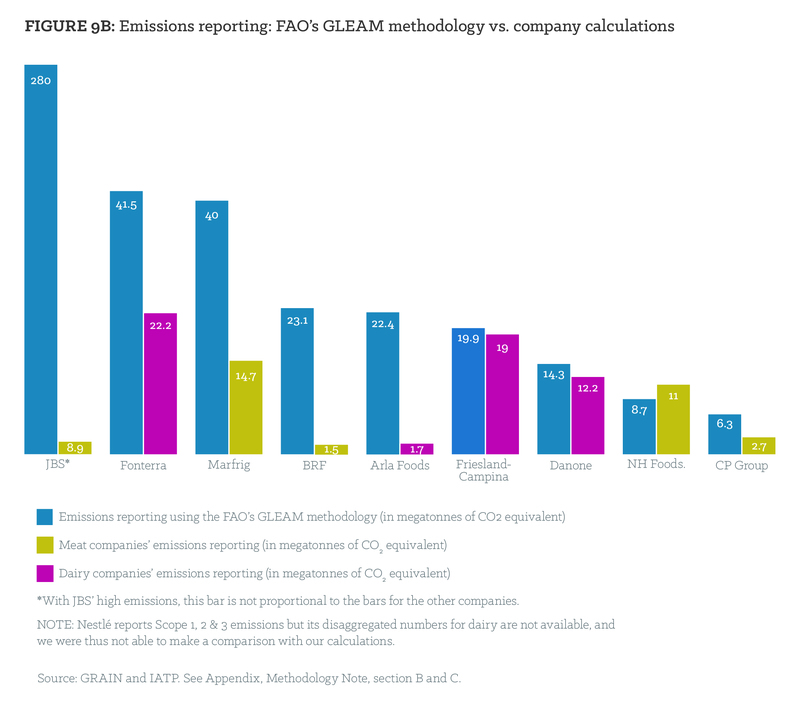 Most of the companies that do report emissions have seriously underreported them and have not included most of their supply chain emissions in their calculations. These supply chain emissions, covering everything from the production of animal feed crops to the methane released by cattle, generally account for 80–90 percent of meat and dairy emissions.12 However, large meat and dairy companies have a particular responsibility to include these upstream emissions in their accounting. As vertically integrated businesses, they exercise significant and often direct control over their supply chains, including feedlot and processing operations, contract farming systems and feed production units. It is thus critical that big meat and dairy companies be held directly accountable for the upstream supply chain emissions, and denied the ability to shift blame (and costs) onto their farmer suppliers or the public. In the absence of comprehensive, transparent data from the largest companies, GRAIN and IATP made approximate calculations of the emissions from the meat and dairy divisions of these companies. We used a new emissions calculation methodology and regional data on emissions from livestock production developed by the FAO called the Global Livestock Environmental Assessment Model (GLEAM), combined with publicly available corporate data on production volumes (see appendix). The numbers are shocking: the combined emissions of the top five companies are on par with those of ExxonMobil and significantly higher than those of Shell or BP (Figure 4). 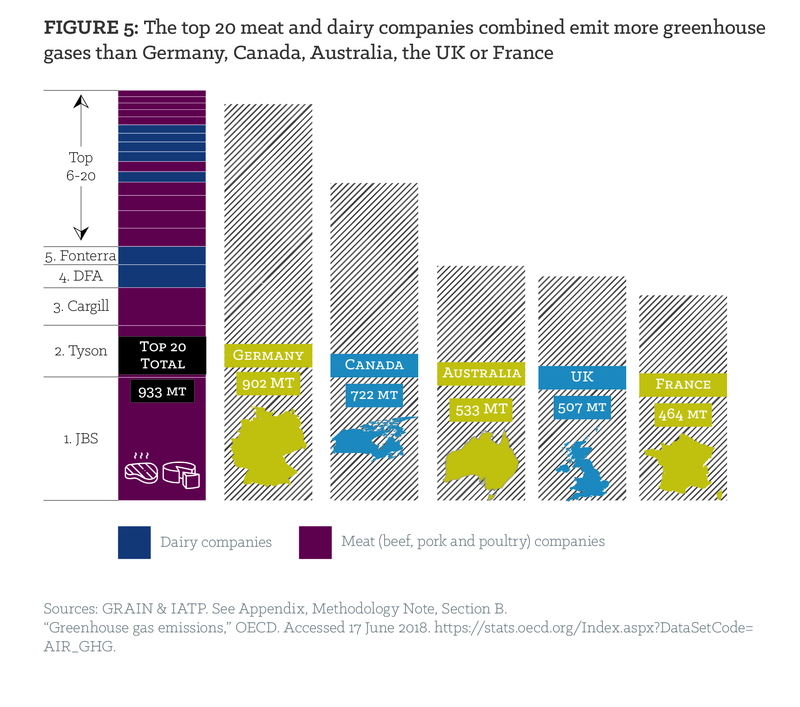 Taken together, the top 20 meat and dairy industry emitters produce more emissions than many OECD countries (Figure 5). The full significance of these companies’ GHG footprint can be understood only when we consider where these emissions are produced. Geographically speaking, most meat and dairy emissions come from a small number of countries or regions with large land masses. The main culprits are the major meat and dairy exporting regions: the United States (U.S.) and Canada; the European Union (EU); Brazil and Argentina; and Australia and New Zealand. These regions, which JBS calls the “surplus protein” regions, have surplus production and high per capita consumption of meat and dairy. These countries account for 43 percent of total global emissions from meat and dairy production, even though they are home to only 15 percent of the world’s population (Figure 6).13 These are also the countries where most of the top meat and dairy companies have their operations (see Box 2). To illustrate the centrality of the surplus protein regions and China, the United States Department of Agriculture’s (USDA) Production, Supply and Distribution Database provides some startling 2017 figures.14 Just six countries or supranational entities (the U.S., the EU, Brazil, Argentina, Australia and China) account for nearly 68 percent of global beef production. Minus China, the five are still responsible for over 55% of world production, with the U.S. producing the largest quantity. Just three countries (Brazil, Australia and the U.S.) account for nearly half (46.5 percent) of global exports—adding India’s buffalo meat exports brings the total to 65 percent of global exports. A similar situation exists for industrial poultry, with the U.S., Brazil, the EU and China accounting for 61 percent of global chicken production.16 Brazil and the U.S. alone account for 63 percent of world exports; if the EU and Thailand are added, the four sources account for 81 percent of world exports. Dairy is no less concentrated. The EU, the U.S. and New Zealand account for nearly half (46 percent) of all global dairy production.17 If China is added, the share of world production rises to 52 percent. Where exports are concerned, the EU, the U.S. and New Zealand account for nearly 80 percent of skim milk powder exports while New Zealand alone produces 68 percent of whole milk powder exports. 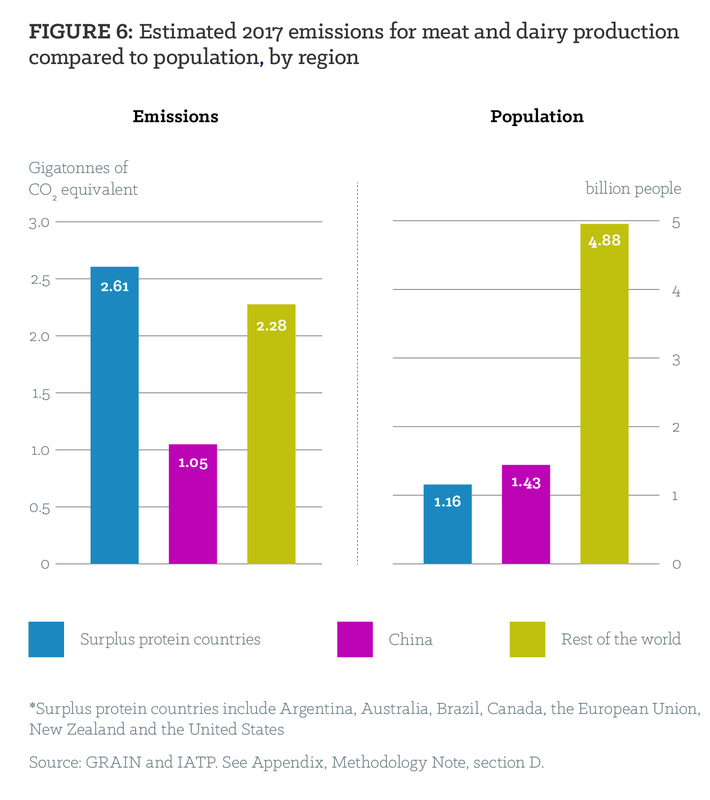 Considering all these statistics, it should come as no surprise that the “surplus protein” bloc plus China account for nearly two—thirds of global emissions from meat and dairy production.18 And emissions from these countries are increasing (Figure 7). If there is to be any chance of limiting the rise in global temperatures to 1.5°C, significant cuts in emissions from meat and dairy production in these countries must be prioritised. 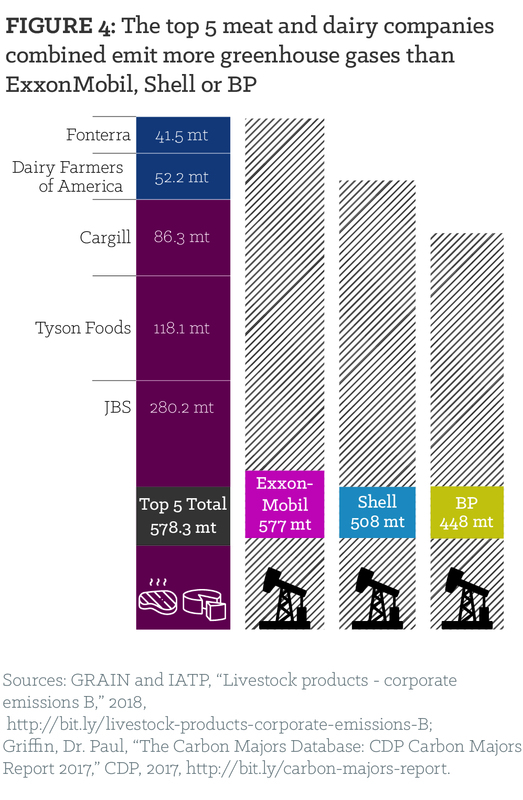 The top 10 companies from each sector whose emissions we examined control a growing percentage of global meat and dairy production. For 2016, we estimate that these companies controlled nearly one—quarter of all global meat and dairy production.27 The extent of their control over production is, however, much more pronounced in the surplus—producing countries, as this is where they have most of their operations. The top 10 beef companies operate out of the major exporting centres of Argentina, Australia, Brazil, Canada, the EU, the U.S. and Uruguay, as well as Japan. 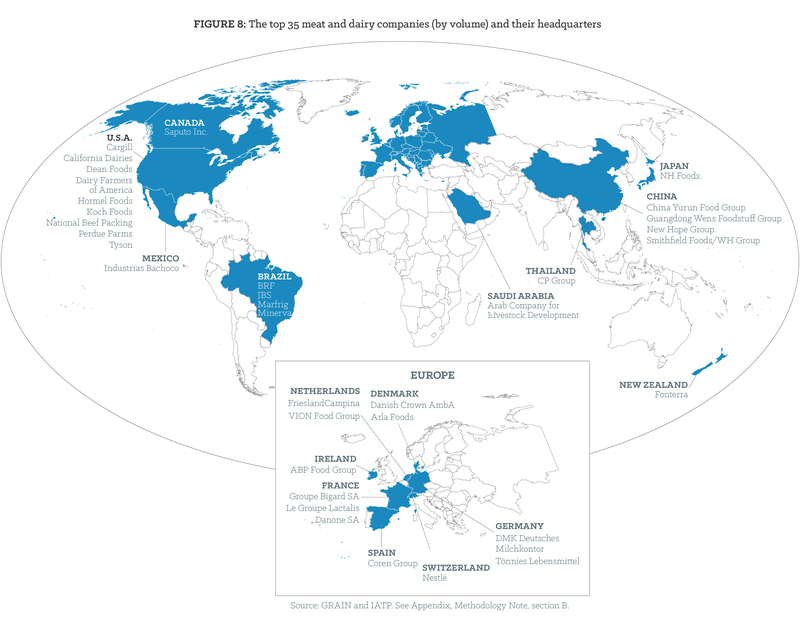 These companies control 37 percent of the production in these countries. The top 10 dairy companies have their major operations in the EU and just four countries: Australia, Canada, New Zealand and the U.S.28 Together, these companies account for 46 percent of dairy production in these countries. The top 10 poultry companies have their main operations in Brazil, China, the EU, Mexico, Saudi Arabia, Thailand, and the U.S. They control 47 percent of these countries’ chicken production. And the top 10 pork companies have their key operations in the exporting centres of Brazil, the EU, and the U.S., where they control about a third of the production. They also operate in China, by far the world’s largest pork producer. When China is added to the equation, the top 10 companies control 19 percent of the pork production in these countries. 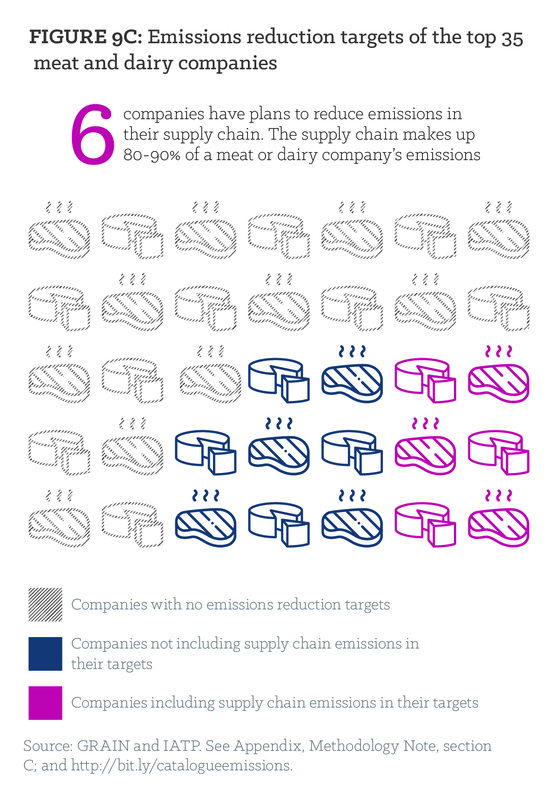 Of the six companies that do include supply chains emissions in their targets, only two have made robust commitments to reduce their absolute emissions. Switzerland—based Nestlé, the world’s largest food company, has committed to reducing absolute emissions by 50% by 2050. Danone, the world’s second largest dairy company in terms of revenue, appears to have gone the furthest in reporting emissions and setting targets. It alone among the top 35 has committed to “zero net emissions” by 2050 (a target consistent with the one laid out in the Paris climate agreement). These reductions extend to its reported supply chain emissions from dairy. 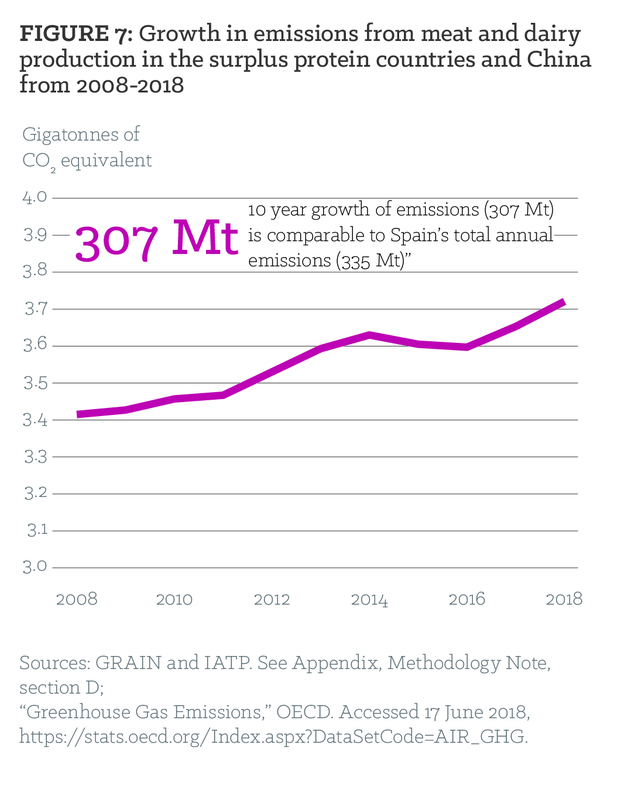 Danone’s supply chain emission calculations appear to be roughly consistent with GRAIN and IATP calculations. And there are other accountability problems, starting with Danone’s action plan. If Danone were to take direct responsibility for zero net emissions by 2050, it would have to begin with a business plan that included cutting its output. But Danone plans to increase production. Rather than taking direct action itself, Danone’s plan apparently assigns the financial burden and investment risks associated with the needed reductions to its farmer suppliers. These farmers will be expected to reduce their emissions per litre of milk, thus reducing emissions intensity, while their absolute emissions will increase if they continue to produce more milk from more animals. Danone’s only other commitment to reaching net zero emissions appears to be an allotment for questionable offset programmes (more on Danone in Box 3). Other companies in the meat and dairy sector also have flawed plans. For example, New Zealand based Fonterra, the world’s largest dairy exporter, plans to increase its production by a spectacular 40 percent in ten years (2015–2025).33 The company claims that it will make this growth “carbon neutral” through reductions in on—farm “emissions intensity,” without providing specifics on how such reductions will occur. Similarly, U.S.—based Smithfield Foods, the leading U.S. pork producer and exporter, and a subsidiary of the world’s largest pork company, WH Group, has pledged to reduce absolute GHG emissions from its U.S.—based operations by 25 percent by 2025 (compared to a 2010 baseline), offering few details about how it intends to achieve this reduction. Based on a careful review of Smithfield’s public documents, the company appears to be reporting on its full range of emissions from its U.S. products. However, by limiting its emissions reduction pledge to the U.S., the company is excluding a significant part of its emissions generated by its parent company, Chinese—owned WH Group. WH Group’s Chinese operations generated 43 percent of the conglomerate’s profits in 2017.34 In addition, Smithfield’s reporting excludes emissions from large operations in Poland, Romania and Mexico. 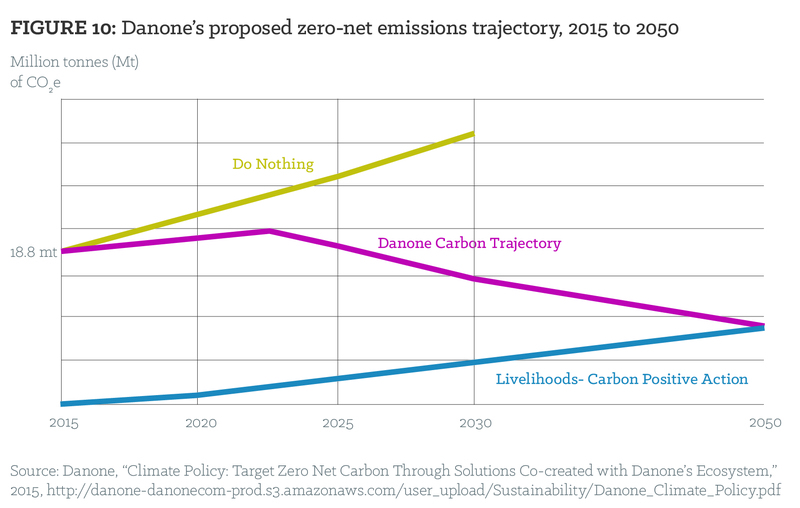 Danone’s proposed climate emissions trajectory from 2015–2050 would see the company increase its output (as implied in the upward—trending “do nothing” line in Figure 10). If this line is an indication, Danone’s production would increase by as much as 70 percent between 2015 and 2030, with similar growth likely between 2030 and 2050. So how can Danone possibly achieve net zero emissions? The only common element in this jumble of corporate promises and inaction on climate change is a commitment to growth. Tyson expects annual growth of 3–4 percent from beef and poultry sales, while Marfrig targeted 7.5–9.5 percent annual growth for 2015–2018.37 This target was set prior to the company’s acquisition of U.S.—based National Beef, making it the second largest beef processor in the world.38 Danish dairy giant Arla plans to add 2 billion kg of milk to its European supply chain between 2015–2020—a 14 percent increase.39 As already mentioned, Fonterra projects a stunning 40 percent increase in its processed milk volume for 2015–2025. To ensure continued export growth, the companies turn to governments to knock down anything seen as a trade barrier, particularly through the negotiation of trade agreements. As trade deals have opened up new markets, exports have become a greater percentage of total production from countries where the top companies dominate, for example with pork in the U.S. Consider the case of chicken. 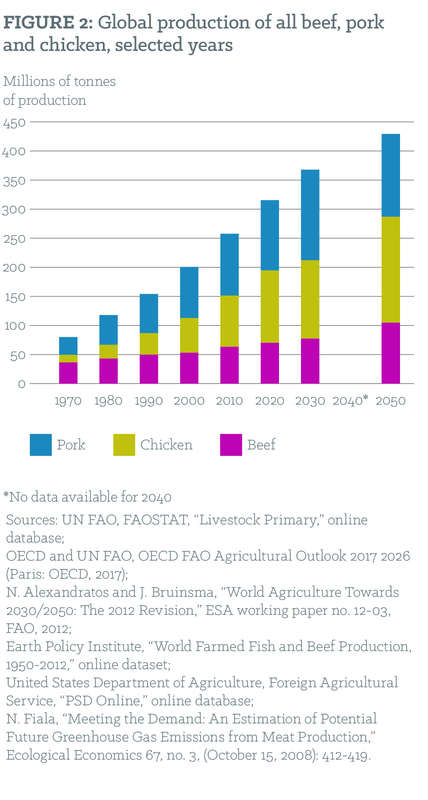 In 2010, the global average GHG emissions per kilogram of chicken were one—third to one—half what they were in 1961.65 But the total GHG emissions from chicken production in 2010 were nearly five times higher than in 1961.66 The reason? Overall chicken production was higher—nearly 11 times higher than in 1961, or five times higher on a per capita basis.67 As emissions intensity was falling, emissions were rising. Even taking population growth into account, the average person was simply eating much more meat than before. In the past 40 years, milk production per cow has more than doubled.73 The European Food Safety Authority has concluded that “genetic selection for high milk yield is the major factor causing poor welfare, in particular health problems, in dairy cows.”74 After just three or four lactations, many cows are no longer able to produce sufficient milk and are prematurely slaughtered. For farmers, the growth of the big meat and dairy operators continues to be an unfolding disaster. In Europe and North America, the relatively few small and medium—sized producers who are not wiped out by agricultural policies that are biased in favour of agribusiness, often find themselves trapped in unfair supply arrangements dictated by these companies, with limited access to other buyers.84 In countries like Kenya, China, India or Brazil, small livestock producers are being pushed off their land to make space for the expansion of industrial farm operations; in many countries of sub—Saharan Africa, they simply can’t compete with the subsidised meat and dairy dumped on their markets. Nor are consumers benefiting from the corporate production of cheap meat and dairy. Overproduction and overconsumption of meat and dairy pose significant threats to public health, not only as major contributors to cancer, obesity, diabetes, high blood pressure and other health problems, but also because factory farms have become a leading source of antibiotic resistance and highly pathogenic diseases. Many consumers try to address these problems by making specific dietary choices. But this, on its own, is a limited solution. We must join forces to fix the food system so that it can supply everyone with moderate amounts of high—quality meat and dairy, in a way that respects people, animals and the planet. Workers, too, need an exit from the repressive conditions of modern meat and dairy factories. The industry is among the most dangerous and least protective of workers, and attracts some of the most marginalised populations. Workers are required to slaughter and process hundreds of animals an hour, for measly wages and under difficult conditions.86 If we slow things down, reduce the scale, focus on quality and bring care and craft back into the trade, meat and dairy processing can once again afford good jobs and dignified work. As this report has noted, cheap meat and dairy comes at a high cost due to social, environmental and animal welfare problems that continue to be under—regulated. In addition, this production is only made possible because the corporations receive an indirect subsidy from taxpayers in the form of government—funded price supports that keep grain cheap.87 It is past time to regulate the industry and redirect the massive subsidies and other public expenditures that currently support the big meat and dairy conglomerates towards local food and farming systems capable of looking after people and the planet. Greenpeace International, “Less is more: Reducing meat and dairy for a healthier life and planet,” 2018. http://www.greenpeace.org/livestock_vision. Mexico is a high importer in part because the North American Free Trade Agreement has created an integrated North American pork production chain across the continent that requires animals or their parts to be traded and processed across the U.S. and Mexico. Where the data refers to “chicken,” it is for broiler meat production and excludes other poultry, such as turkey or layer hens. Calculations by GRAIN/IATP based on USDA country data and carcass weight equivalent volumes for beef determined by company—reported slaughter volumes and FAO carcass weight conversion factors. For chicken, volume is based on weight of slaughtered chicken. We used company reports to estimate that 86% of JBS’ reported Latin American beef production is in Brazil; 80% for Marfrig; and 80% for Minerva. Based on company—reported production volumes compiled by GRAIN/IATP and world production data from USDA FAS. Based on company reports, we estimate that only 6% of total dairy production by the top 10 companies occurs outside of Australia, Canada, the EU, New Zealand and the U.S.
See Gerber, Pierre, Theun Vellinga, Carolyn Opio, and Henning Steinfeld, “Productivity Gains and Greenhouse Gas Emissions Intensity in Dairy Systems.” Livestock Science 139, nos. 1–2, July 2011. This study concludes that top—level emissions reductions in European dairy are in the range of 14–26%. See S.J. Gerssen—Gondelach et al., “Intensification pathways for beef and dairy cattle production systems: Impacts on GHG emissions, land occupation and land use change.” Agriculture, Ecosystems & Environment, vol. 240. http://dx.doi.org/10.1016/j.agee.2017.02.012. 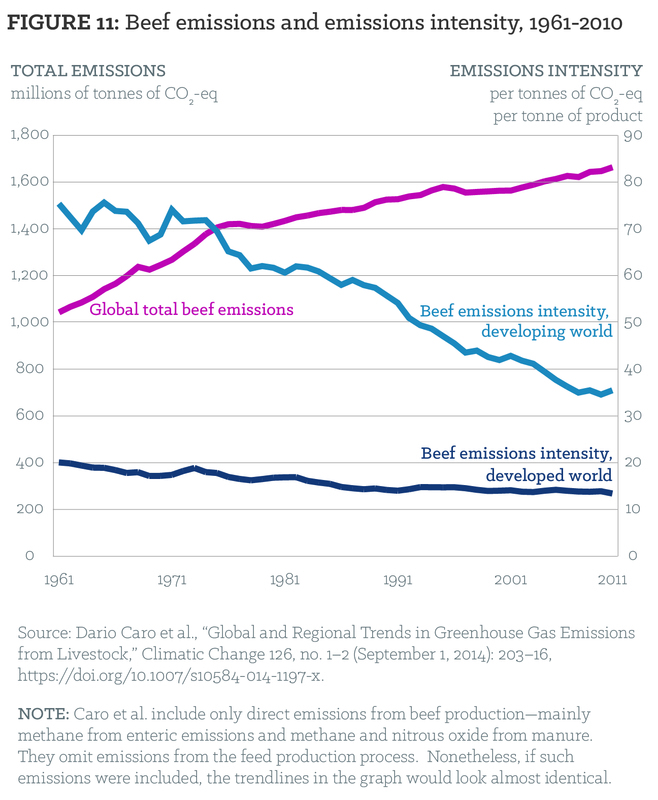 For an analysis of the emergence of the concept of “emissions intensity” in the international debate on agriculture and climate change, see Kalyn Simon, “What’s at steak? The political discourse of greenhouse gas emissions and the implication of animal agriculture,” 2017. https://repository.usfca.edu/thes/257/. Simon found that “emissions intensity” in agriculture was not mentioned in any of the first four IPCC assessment reports but appears 14 times in the Fifth Assessment Report (AR5) of 2014. Dario Caro et al., “Global and regional trends in greenhouse gas emissions from livestock,” Climatic Change 126, nos. 1–2 (September 1, 2014): 203–16, https://doi.org/10.1007/s10584—014—1197—x. Dario Caro et al., “Greenhouse gas emissions due to meat production in the last fifty years,” in Quantification of Climate Variability, Adaptation and Mitigation for Agricultural Sustainability (Springer, Cham, 2017), 27–37, https://doi.org/10.1007/978—3—319—32059—5_2. On animal welfare and environmental sustainability, see: M.T. 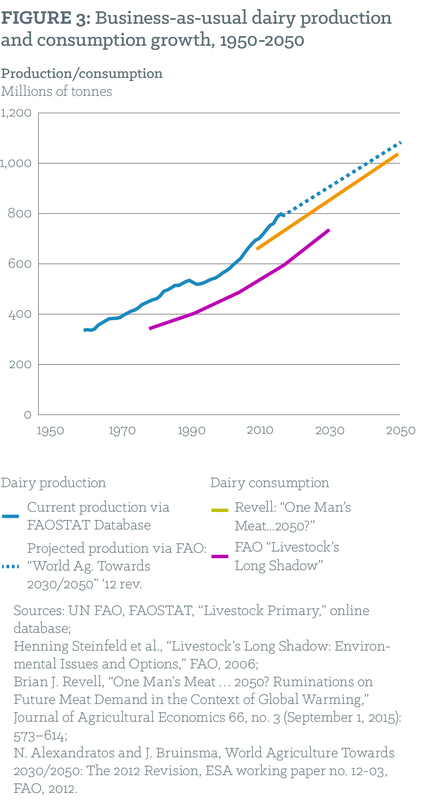 Scholten et al., “Livestock farming with care: towards sustainable production of animal—source food,” 2013. FAO, webpage “Animal Welfare at the heart of sustainability” accessed at: http://www.fao.org/ag/againfo/home/en/news_archive/2014_Animal_Welfare_at_the_Heart_of_Sustainability.html.